"I use to make regular cabbage rolls until I found this recipe. Now, instead, I make this and it is as good as the regular cabbage rolls and alot easier." In a large skillet, brown beef in oil over medium high heat until redness is gone. Drain off fat. In a large mixing bowl combine the onion, tomato sauce, cabbage, rice and salt. Add meat and mix all together. Pour mixture into a 9x13 inch baking dish. Pour broth over meat mixture and bake in the preheated oven, covered, for 1 hour. Stir, replace cover and bake for another 30 minutes. 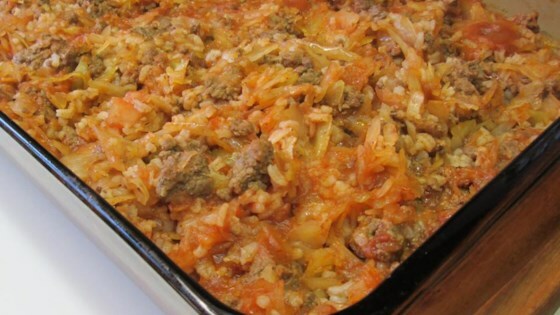 See how to make an easy, hearty, beef and cabbage casserole. This is so GOOD & EASY !!! I make it even simpler by putting it all in a crockpot...only use long cooking rice.